Don't see your country, state or province listed? Order the Mike Beck CD today! By my reckoning, all I have to do is get one CD to each country on Earth, then the bootleggers will do the rest! 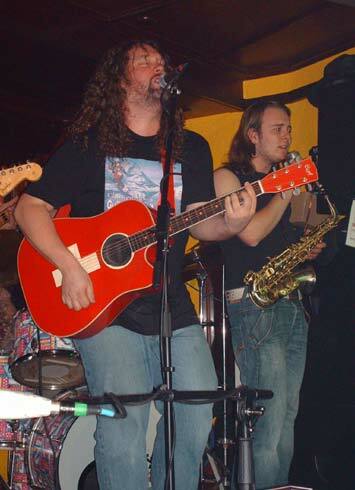 Mike performing with Electric Beans at the Highland Hotel in Soest, Germany on Wednesday, November 20, 2002. 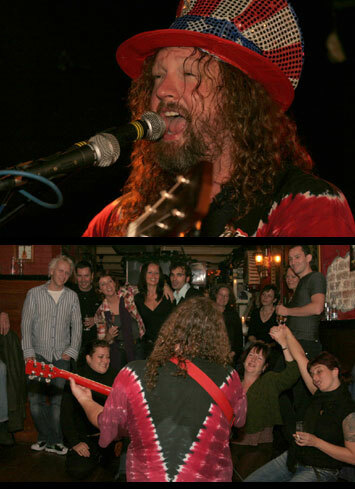 Mike appearing with Rob Orlemans & Half Past Midnight at Bluezy Radio Ridderkerk's 10 Year Anniversary Festival. See more photos in the tour diary. 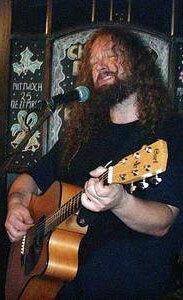 Mike performing at Le Bar'B'art in Saint Avold, France in 2003. See more photos in the tour diary. Poster for our most recent New Year's Eve gig, designed by Joe Talamantez. See photos of the celebration in the tour diary someday. Opening night of my Autumn 2007 European Tour at Backstage in Deventer, The Netherlands as part of the Muziek-Totaal Festival, Thursday, October 25, 2007. Photos by Eddy Dibbink / Goed Bezig. 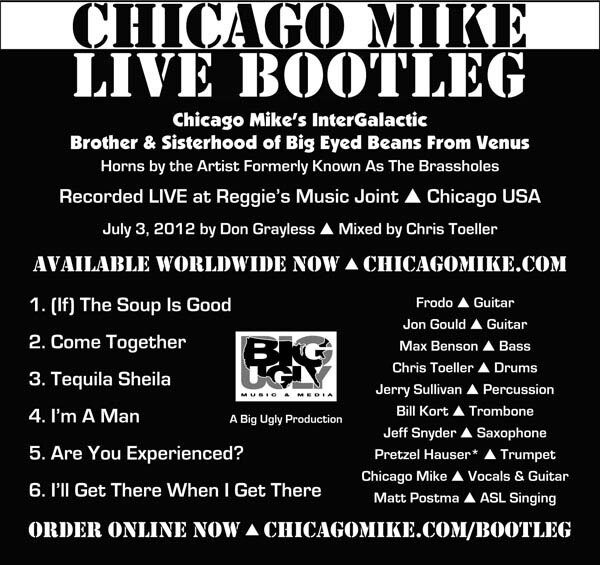 Chicago Mike's InterGalactic Brother & Sisterhood of Big Eyed Beans From Venus, with Horns by the Artist Formerly Known As The Brassholes - Recorded Live July 3, 2012 at Reggie's Music Joint - Chicago, Illinois USA - Now available on CD! $7, includes shipping anywhere in the USA. 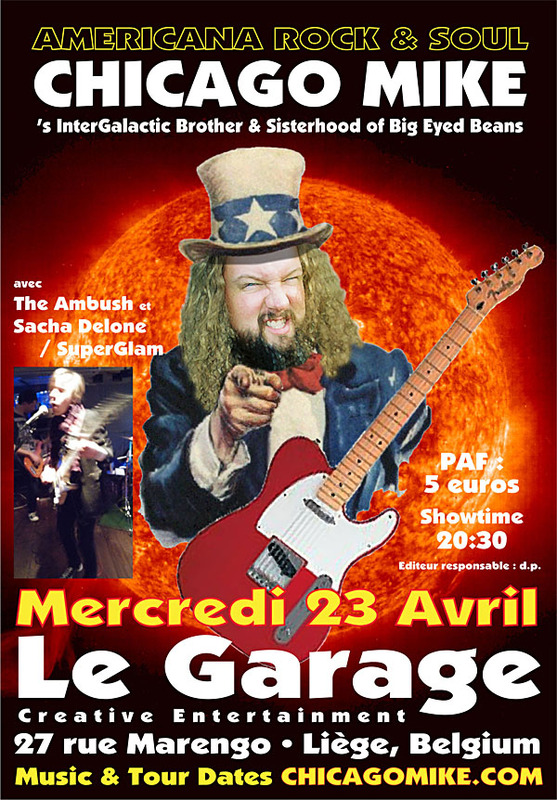 Fundraiser for the Tim Ouburg Action Van at Le Garage in Liège, Belgium set for Wednesday, 23 April, with special appearances by Sacha Delone / SuperGlam and The Ambush! One of the 87 members of Chicago Mike's InterGalactic Brother & Sisterhood of Big Eyed Beans is ASL singer Matt Postma. 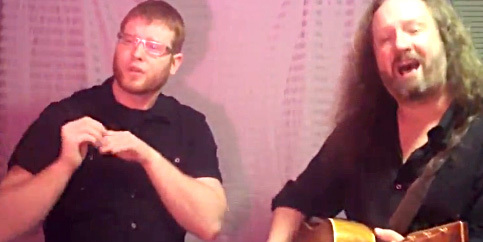 Matt is an incredibly talented ASL interpreter, signer and singer -- He has performed ASL (American Sign Language) on stage with The Who, Aerosmith, Red Hot Chili Peppers, Ben Folds Five and many more. He has performed at the Kennedy Center in Washington D.C. for Vice-President Joe Biden and international dignitaries. Matt and Mike are proud to announce the debut of the very first video on their new YouTube channel SongsInSign.com. Ultimately, the channel will present a library of Matt and Mike's favorite songs, from the iconic to the obscure, with Matt delivering the ASL and Mike holding down his end on vocals and guitar. They've already recorded performances of Steely Dan's "Everything Must Go" and one of Mike's originals "Good Times at the Old-Inn", but the first video they've released is a song by John Hiatt entitled "Through Your Hands". ASL singer Matt Postma and Chicago Mike Beck: A still from their first Songs-In-Sign video, John Hiatt's "Through Your Hands", shot December 20, 2012 at Big Ugly World Headquarters in Libertyville, Illinois USA. This show was so fun! Thank you Donna for inviting us to play! DJ Arrigo on guitar and bass, Claudio Adamo on guitar, Pred Petrovic on guitar, banjatar and bass, Dennis O'Connor on harmonica and backup vocals, Ryan Johnson on drums, Jake Niemiec on guitar and vocals, Jerry Sullivan on djembe and vocals, Steve Vignocchi on vocals, Dave on vocals -- It was quite the jam! See you in Summer Donelli's for a party on the patio! 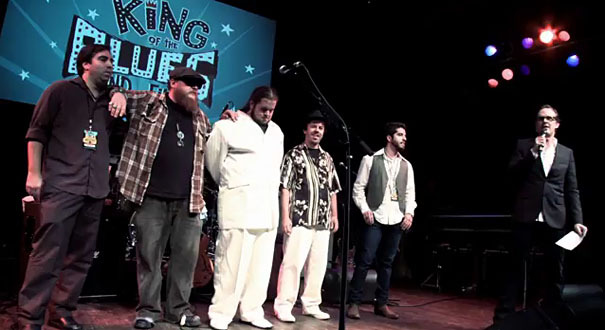 Big Eyed Bean From Venus Pred Petrovic (4th from left) on stage with the Grand National Finalists in Guitar Center's King of the Blues Guitar competition, with host Joe Bonamassa at far right. Pred's an astonishing guitar player, originally from Serbia, but ultimately lost to Louisiana's Jonathon Boogie Long (3rd from left). My heartfelt congratulations to all the finalists on an amazing accomplishment! We're all proud of you Pred! 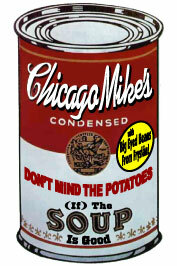 As some of you may know, the name of my band is Chicago Mike's InterGalactic Brother & Sisterhood of Big Eyed Beans. At last count, there are 74 Beans scattered across the globe. One of our most gifted Beans is Serbian guitarist Pred Petrovic, who has been playing with us on and off since 2007, and toured in Switzerland with us in November 2008. I just got home yesterday from my tour of Colorado and Arizona and received INCREDIBLE NEWS! Pred was named the winner of the Midwest Regional Finals in Guitar Center's "King of the Blues Guitar" competition, and will appear TONIGHT alongside guitar-übermeister-wundermensch Warren Haynes and host Joe Bonamassa at House of Blues in Hollywood, competing in the Grand Finals against the winners from the other 4 regions. We are incredibly excited for Pred, and wish him great success in tonight's competition! We'll post the results as soon as we hear! Hopefully, West Coast Beans Neal Daniels, Ben Masters, Elissa Rosen and Christopher Hawley can attend the show and cheer him on. ALL 74 BEANS ARE ROOTIN' FOR YA, PRED! DO WHAT YOU DO BEST - PLAY YER GUITAR! It's hard to believe - Our bandmember and Brother Bean on stage with Warren Haynes and Joe Bonamassa! We are SO STOKED! We'll post photos and / or video if we can get some! EYE OF THE TIGER PRED!!! EYE OF THE TIGER! As some of you may know, I include a cover of Warren Haynes "Soulshine" on my Chicago Mike Beck CD, and Warren's music has been a huge inspiration in my life. Wow. Wish I could be there to cheer you on Pred! We're all super proud of you! Claudio, the original Big Eyed Bean From Veneto, lives in Verona, Italy. By coincidence, he is in the Chicago area THIS WEEKEND to play several gigs with me, starting tonight at 545 North in Libertyville, Illinois, this Friday and Saturday night at the Gale Street Inn in Mundelein, Illinois and this Sunday at our annual backyard Hootenanny! Email if you'd like an invitation! 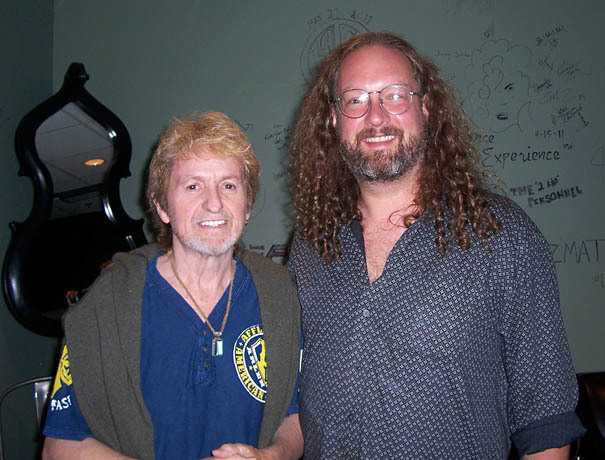 Lead singer and songwriter from the band Yes Jon Anderson with Chicago Mike Beck backstage at Viper Alley in Lincolnshire, Illinois USA on Wednesday, August 3, 2011 - Jon's solo acoustic show that evening was an inspiration! Thanks Raymond Benson for making that happen! After that, I'm heading to the South Rim of the Grand Canyon for 5 shows at the historic Bright Angel Lodge, August 23rd - 27th. Special guests will be on hand throughout the week, and you can count on several appearances by "Bean 69", the Postpotatolator himself! We arrived in Nederland last night, hunkered down in Tilburg, in the province of Brabant in Holland's deep south. 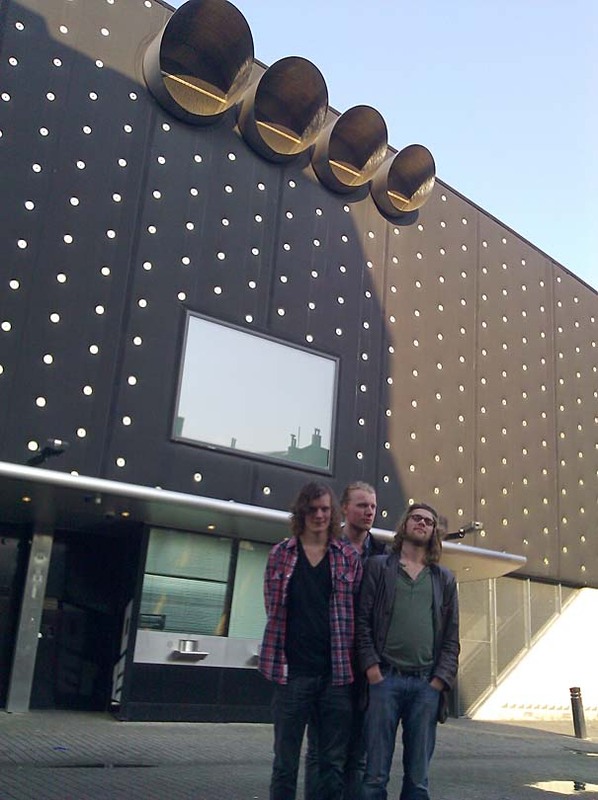 Our friends SugarSweet opened for Graveyard tonight and we enjoyed a night off at Tilburg's premier venue 013. I played here a few years ago with Andre Williams, Kenn Goodman of New Duncan Imperials and Jordy Duitscher from Trailer Trash Tremblers. 013 features 3 great rooms, sometimes with all three presenting bands simultaneously! Years ago, I caught a great Buddy Miller show in the Groote Zaal. A great venue. Tomorrow, the circus packs up and hits the road for Friesland -- The lineup on these shows is like a dream come true: Eibe Gerhartl on bass, Tim Ouburg on Hammond and piano, Rens Ouburg on guitar, Neal Daniels on drums and special appearances by Big Eyed Beans From Fryslân Boy Brostowski and Rik Meyer on Saturday night at Scooters Leeuwarden. Sunday we're going to hang out in Amsterdam, and then sadly, Neal flies home to Los Angeles for gigs with Darren Criss. We're going to miss you brother! Thanks for making this European tour so fun, and rocking so hard! The tour continues next week without Neal with gigs in Holland, Germany and Luxembourg. We've had an AMAZING run of gigs in Zermatt, Switzerland. We played our final 2011 Papperla Pub gig on Saturday night, final 2011 StafelALP show on Sunday afternoon, and a final blowout special Rock'n'Roll Sunday jam session to a packed house at Schneewittchen with The Scenit Group (aka Brando from the UK) and Empire from Stockholm, Sweden. Zermatt is PURE MAGIC! See you next year! Tomorrow, we head up to The Netherlands to catch SugarSweet at 013 in Tilburg, then play two of our favorite venues in Friesland for the Queen's birthday - Koninginnendag! This Friday 29 April at Scooters Drachten and Saturday 30 April at Scooters Leeuwarden, with a street festival performance on Saturday afternoon in Drachten, featuring an incredible lineup of world-class Beans: Eibe Gerhartl on 7-string bass, Neal Daniels on drums, Tim Ouburg on keys, and Rens Ouburg on electric guitar. The following week, we've got a couple gigs in Holland, Luxembourg and Germany, then home to the USA. More tour photos will be posted shortly! The band just arrived this morning, March 1: My drummer Kevin Jones and I flew in separately from Chicago to Zurich, and then caught a train to Visp, then a bus to Saas-Grund. 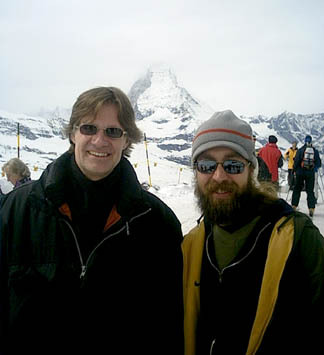 My bassplayer Brad Armstrong flew from Salt Lake City to Seattle to Paris, then finally to Geneva, where he caught the train to Visp and a bus to Saas-Grund, and my keyboard player Tim Ouburg drove down from The Netherlands, leaving at 5am, arriving in Saas-Grund around 4pm. The rest of the band - Stew Antelis from Chicago and Mitch Lewis from Toronto, Ontario are already in nearby Zermatt and will head over to Saas-Grund tomorrow evening. Can't wait for our first show together! 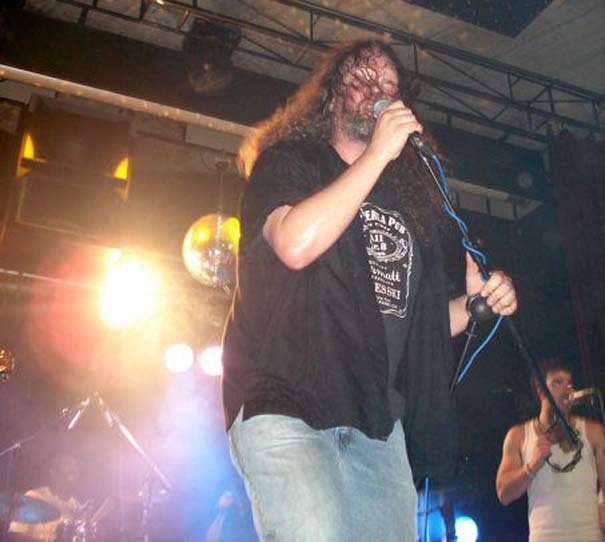 The Old-Inn is run by two brothers, Aldo and Christoph Venetz, and our shows here are some of the most over-the-top crazy parties of anywhere we play! The band travels to Saint-Avold, France for a gig on Saturday, March 5, followed by a first-time appearance at The Irish Bar in Morsbach, France on Sunday. Then we're back to Switzerland for a run of 12 shows at the legendary Papperla Pub in Zermatt. I first met the musical dynamo named Talia Keys at Planet Bluegrass' SongSchool in Lyons, Colorado, August 2009. Multi-instrumentalist, singer, songwriter, groove-angel -- Her band Marinade lays it down. 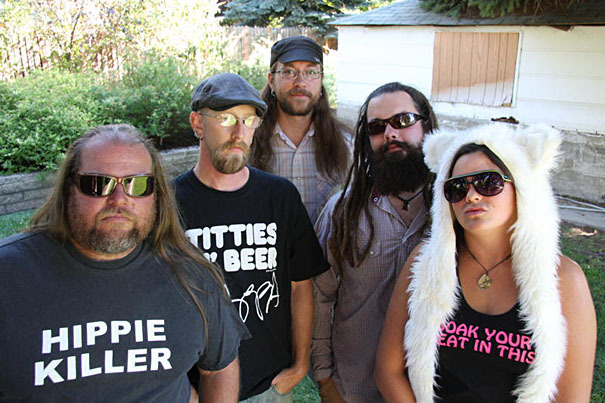 Talia graciously invited me to open their show at the legendary Owl Bar at Sundance Resort on Froday, January 28th, closing weekend of the Sundance Film Festival. Great fun! I'll start the show solo at 9:00pm, followed by a Marinade set at 10:00pm. Then, I expect a jam of mythological proportions to follow. Marinade wowed festivarians last year with awesome sets at Access Film-Music Showcase, and will do so again in 2011 with performances at The Spur (352 Main Street) on Wednesday, January 26 at 10pm and Saturday, January 29 at 7pm. Talia will also take part in a rare acoustic "in-the-round" set with Moors & McCumber on Wednesday 1/26 at 7pm. It's Film Festival Week!!! SO fun. The Big Eyed Beans From FUFMO franchise of Chicago Mike's InterGalactic Brother & Sisterhood of Big Eyed Beans will also be presenting some new original material at Access Film-Music Showcase -- We hit the stage of The Spur at 10pm on Thursday, January 27th. Access Film-Music Showcase Opening Night "Sneak Peek" Launch Party kicks off at 6pm on Thursday, January 20th with an incredible lineup, including Ellis, My My My, Greg Klyma, Parkin' Lot, Hans York, Danielle French, Barbara Martin, Scott Dale and City Fritter. Starting Friday, January 21st, music at The Spur begins at 3pm every day of Film Festival Week, January 20 - 30, 2011. Opening weekend headliner Melvin Taylor is primed to blow the roof off The Spur again Friday and Saturday 1/21 and 1/22! Every winter in Park City, magical miracles transpire. We'll do our best to share the happenings and celebrity sightings with you as best we can through our website, Facebook, Twitter, YouTube, Skype, smoke signals, telepathy, ritual chanting and additional means of data transmission currently under development. Three or four years ago, I encountered one of the Olson twins! Composer / Recording Artist / Painter / Iconoclast / Inspiration / Don Van Vliet is dead. Long live Captain Beefheart! When people ask me the name of my band, and I tell them "Chicago Mike's InterGalactic Brother & Sisterhood of Big Eyed Beans", they're usually caught by surprise and occasionally inquire where the name comes from. The long answer can be found below. The short answer is Don Van Vliet. 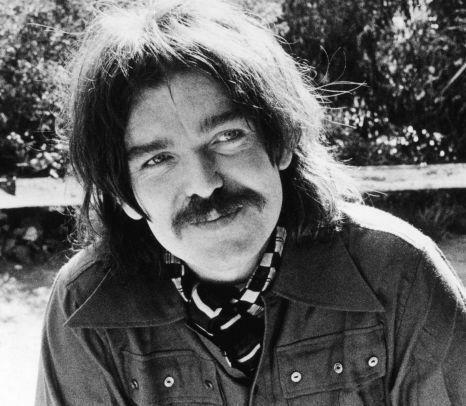 Mr. Van Vliet (née Donald Glen Vliet), along with members of his aptly named "Magic Band", made some amazing records under the name Captain Beefheart, recorded a few exciting collaborations with Frank Zappa, and succeeded magnificently in blowing my musical mind. His album "Clear Spot" was a constant soundtrack during frequent road trips with Todd Freeman from Southern Illinois University in Carbondale to my very first "real" recording sessions in Paducah, Kentucky in the late '80s. Deepest thanks to Todd for turning me on to Captain Beefheart. You changed my life. On "Clear Spot" appears a song entitled "Big Eyed Beans From Venus". When I began performing in Illinois with Little Red Babyface Kaplan in 1999, we adopted this song title as the name of our little acoustic duo. Since then, the band has grown into a world-class rock'n'soul orchestra boasting 69 members scattered across the globe, divided up into regional franchises: Big Eyed Beans From Venus in Chicago, Big Eyed Beans From FUFMO in Utah, Big Eyed Beans From Fryslân in the north of Holland, and Big Eyed Beans From Veneto in northern Italy. Collectively, they comprise Chicago Mike's InterGalactic Brother & Sisterhood of Big Eyed Beans. You can hear a short clip of our chosen theme song at BigEyedBeansFromVenus.com and learn more about invidividual Beans. Thank you Don Van Vliet for living your life walking the path of an artist, sharing your unique vision with the world, and inspiring me in so many ways. You didn't just push the envelope, you deconstructed it and folded it into an origami tsuru! The world is not quite as colorful today. ChicagoMike.com has a QR Code! Want to turn somebody on to my music? Save and send this QR code to your family, friends, enemies, people you don't know - Anybody! Everybody! This QR code takes them right to ChicagoMike.com, quickly and easily! What the heck's a QR code, you ask? 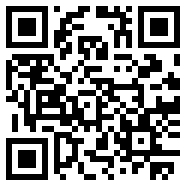 Here's a great article, with a link to a site where you can create your own: "2011 - The Year of the QR Code" on TheThinkingStick.com. New Year's Eve and New Year's Day: The InterGalactic Brother & Sisterhood Reassemble! The electric band will reunite for these two shows, presenting some new original music and blazing fresh covers! 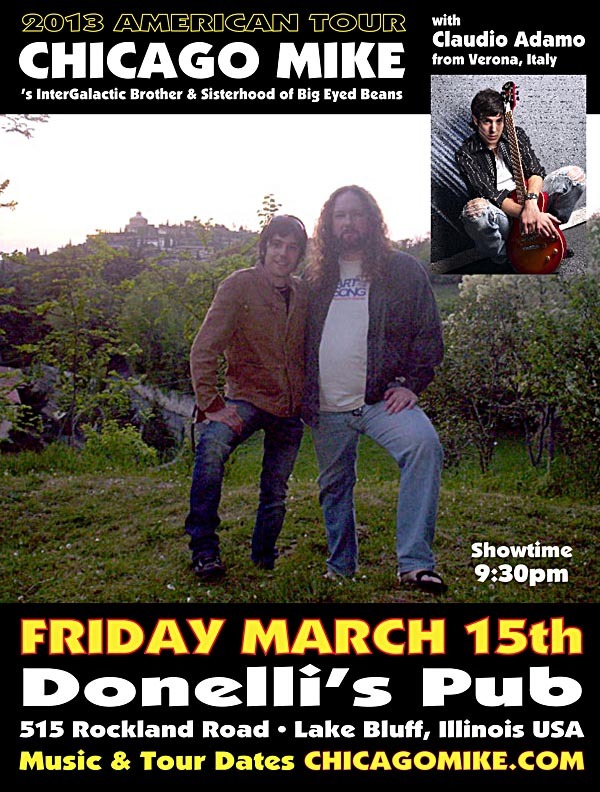 These gigs will feature one of my very favorite lineups: The amazing Serbian double-neck guitar virtuoso Pred Petrovic, who toured Switzerland with the Beans in the Autumn of 2008; and Max Benson (bass) and Neal Daniels (drums), who toured Europe with me in Spring 2009. Max has been playing shows with me in the Chicago area, and we did several dates in Colorado together this past Summer. He's also been tearing it up with his Jazz Fusion Group at venues like S.P.A.C.E. in Evanston, Illinois and he played a recent gig at the illustrious Chicago venue Joe Segal's Jazz Showcase. In the Summer of 2009, Neal moved to California, where he attends the Los Angeles Music Academy, studying under the legendary Ralph Humphrey, drummer on Frank Zappa's early '70s masterworks "Apostrophe" and "Over-Nite Sensation". 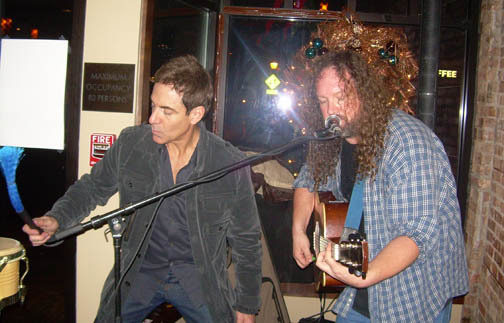 Though I miss having Neal in Chicago, we've played a couple shows together in Southern California, which were a lot of fun. Neal is also earning a reputation as an excellent live and studio drummer throughout Los Angeles, playing with several exceptional bands, including my buddy Bruce Garnitz. Neal recently appeared in the music video for Paul Nagi's single "Quite Gorgeous" and just wrapped shooting a new about-to-be-released video for Sima, shot at the Houdini mansion! Perhaps most astonishing of all, Neal recently landed a gig in the band of Darren Criss, star of the TV series Glee -- Neal's been playing drums for Darren's band at sold-out shows at celebrated L.A. venues like The Mint and The Roxy! So it's likely that soon, I'll never be able to afford Neal again! 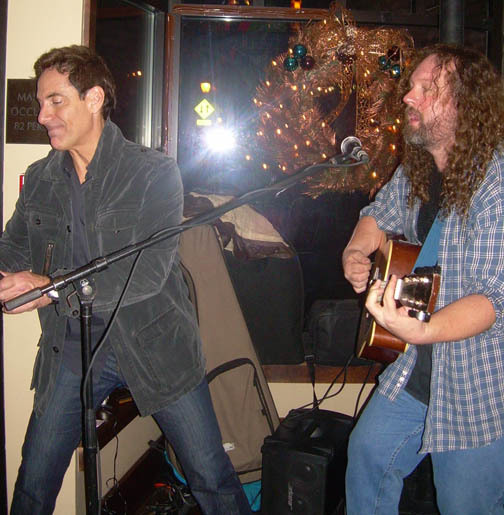 So come see him play with my band while you still can -- New Year's Eve at 545 North in Libertyville (NO COVER CHARGE!) and New Year's Day at Reggie's Music Joint in Chicago ($5 cover charge). Neal is scheduled to tour Switzerland and The Netherlands with me this April after he graduates from L.A.M.A., but now that he's playing with superstars, who knows what might happen! Fans of Frodo will be glad to know that he'll be playing guitar with us, alongside Pred, at Reggie's on January 1st. Unfortunately, on New Year's Eve, he's playing a gig with his other band Crooked Moon, so won't be able to join us 'til 2011. We'll miss you Frodo! 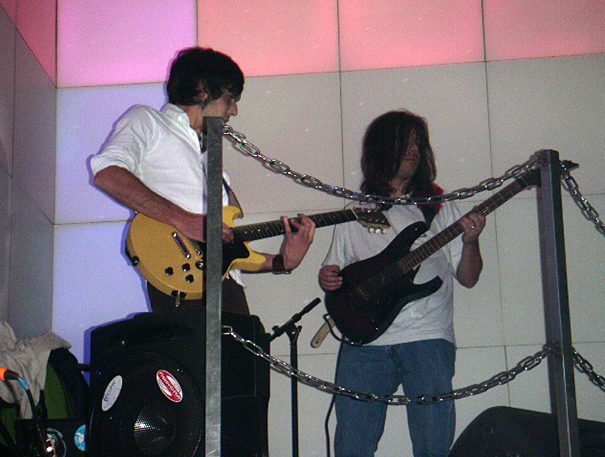 OurStage.com runs several music competitions for independent recording artists. Turns out our song "(If) The Soup is Good", which I co-wrote and recorded with Big Eyed Beans From Fryslân Rik Meyer and Boy Brostowski, has done pretty well lately in the "Southern Rock" category: As of today, the song is at #8 in the standings out of 224 competing entries. Yesterday, it was at #9 -- Looks like we're moving in the right direction! I haven't figured out exactly how you can influence the standings, but I think it involves listening to a LOT of music. If you've got some free time, visit OurStage.com, click on "JUDGE", take a listen and help us get to #1! 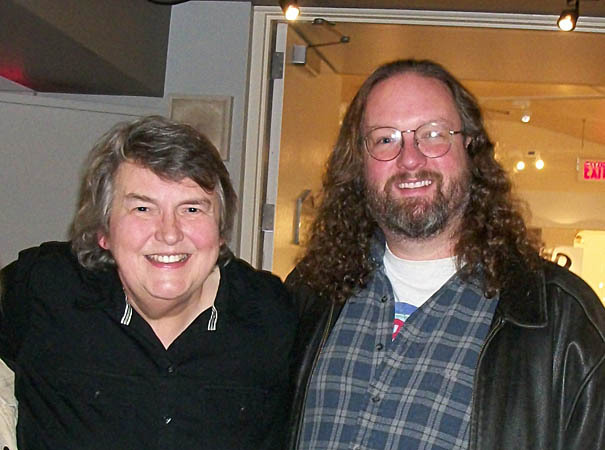 Mike and Heather meet Chicago Radio Legend Terri Hemmert! I received notification in early September that I have have been named a recipient of the 2010-2011 ASCAPlus Award, given to select songwriters in ASCAP's Jazz & Popular Music Division. ASCAP is the American Society of Composers, Authors & Publishers and serves as the performance rights society for most of America's published songwriters, collecting and distributing royalties earned through broadcasts and live performances of our works. This is the first time I have won this award, and I appreciate ASCAP for the recognition. Thanks! The annual regional conference of the Folk Alliance Region - Midwest, dubbed the "FARM Gathering" is taking place Friday, Saturday and Sunday, October 8 - 10, 2010 at the Holiday Inn in Bolingbrook, Illinois. On Friday, I am scheduled to present my workshop "PASSPORT REQUIRED: International Touring without a Record Label, Manager or Booking Agent" which gives artists guidance and resources for planning and executing their own international tours. Details about the workshop are online at BigUgly.com/international_workshop and more information about FARM Gathering is on the F.A.R.M. website at FarmFolk.org. We have started to confirm bookings for my Spring 2011 European Tour. The tour will kick off with performances by Chicago Mike's InterGalactic Brother & Sisterhood of Big Eyed Beans in Switzerland starting the first week of March 2011, and will continue with solo acoustic shows and a few band performances in Italy, The Netherlands, Germany and France through May. Dates will be added to the tour calendar as they are confirmed. Chicago Mike performing with the Scenit Group at Vernissage in Zermatt, Switzerland - April 11, 2010. 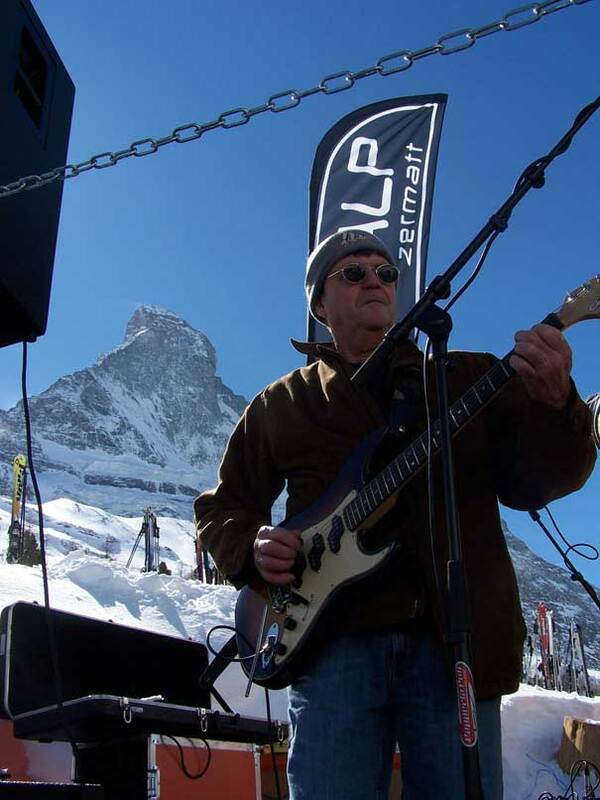 Chicago Mike performing in the shadow of Mont Cervin at StafelALP in Zermatt, Switzerland - Spring 2010. 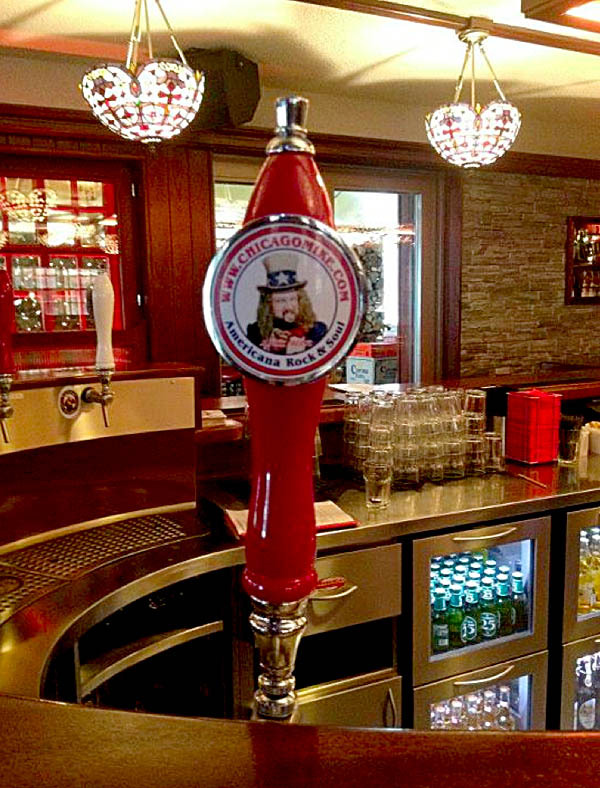 An abbreviated Spring European Tour brings me back to my favorite venues in Switzerland: The Papperla Pub and Schneewittchen in Zermatt, and the Old-Inn in Saas-Grund. The tour started Wednesday, February 24 with a performance at Papperla Pub, followed by shows featuring special guests Sean Mackie, the Eddie Jordan Band and legendary progressive rock guitarist Mike Rutherford from the bands Genesis and Mike & The Mechanics. 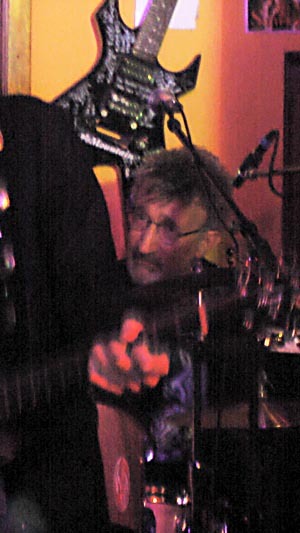 Fans of Formula 1 Racing are quite familiar with the UK's Eddie Jordan, but may not realize he's also an accomplished drummer and bandleader. 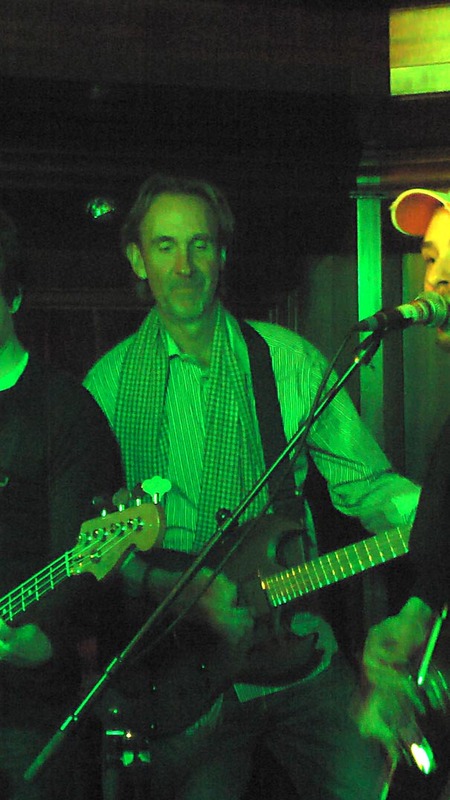 Legendary progressive rock guitarist Mike Rutherford and Chicago Mike at Papperla Pub in Zermatt, Switzerland - February 25, 2010. My buddy Stew Antelis brought me to Germany for my very first shows in Europe way back in 2001. When my Mom passed away March 1, Stew graciously stepped up and led my band for shows at Papperla Pub while I flew home to Chicago to be with my family. Deepest thanks to Stew from me, my family, and the InterGalactic Brother & Sisterhood of Big Eyed Beans -- We couldn't have made it without you! Though I'm not scheduled to perform, I am hosting a music showcase for Access Film-Music Ltd. from Friday, March 12 through Sunday, March 14 in Paris, France in conjunction with the 5th annual ÉCU, the European Independent Film Festival. Artists scheduled to appear include Unison Music recording artist Bobby Syvarth from Brooklyn, New York and James Moors from Superior, Wisconsin. The closing night celebration features a concert cruise aboard The River King down la Seine, the river that cuts through the heart of Paris. Full festival and showcase details are online at AccessFilmMusic.net/ecu. 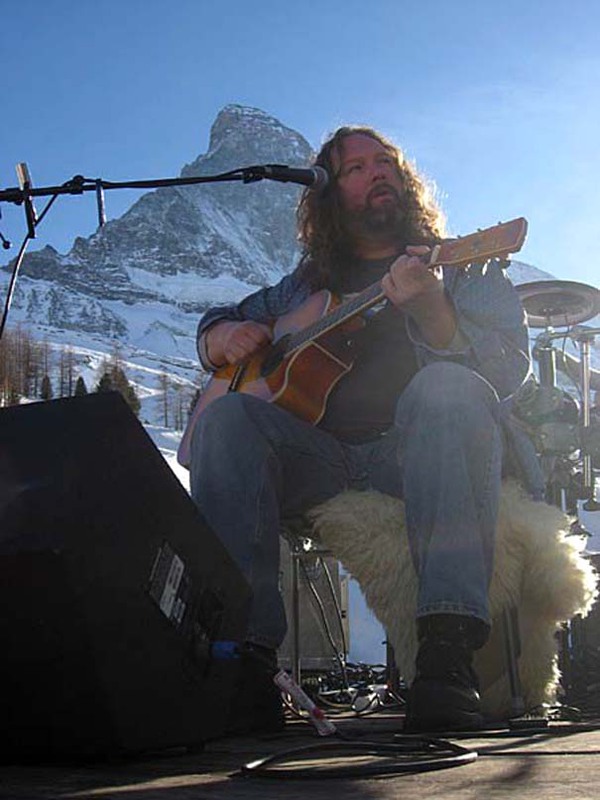 Guitar maestro Robbie Stokes (Grateful Dead solo albums, Quicksilver Messenger Service, Norman Greenbaum) playing with Chicago Mike's InterGalactic Brother & Sisterhood of Big Eyed Beans at StafelALP in Zermatt, Switzerland - March 13, 2009. Photo by Tim Ouburg. 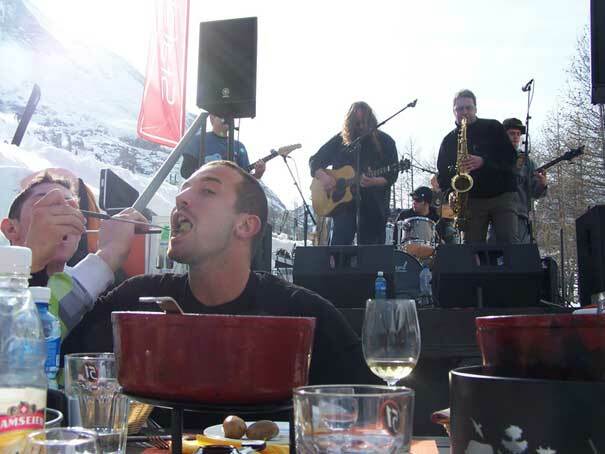 Friends dine on the finest Swiss fondue while enjoying music from Chicago Mike's InterGalactic Brother & Sisterhood of Big Eyed Beans at StafelALP in Zermatt, Switzerland - March 13, 2009. Photo credit unknown. To see more photos of the Beans Spring 2009 European Tour, click here. New shows in April have just been added to my Spring 2009 European tour calendar, including several dates in Germany and my first-ever performance in the country of Luxembourg on Friday, 24 April at The Black Stuff in Pulvermühle. My annual "grand retour" to Le Bar B'art in Saint-Avold, France, originally scheduled for Saturday, 28 March has been moved to Saturday, 25 April. Merci Annie et Manue!!! Grand baissers! I'll be in Memphis this week, speaking on a panel "Folk Around the World" at the National Folk Alliance Conference, taking place at the Memphis Marriott from Wednesday, February 18 thru Sunday, February 22. I'm also performing at Ruthie Naccarato's "Utah Folk at its Finest" Showcase and James Moors' "A Little Bit Marvelous" Showcase, which is being presented in conjunction with my music publisher Access Film-Music. I'm particularly excited about a couple "songwriters in the round" sessions I'm performing with my friends James Moors and Joe Jencks. If you see me, please tell me if I've got barbeque sauce on my face! Bean Stew - Chicago Mike's InterGalactic Brother & Sisterhood of Big Eyed Beans From FUFMO soak it up at Mystic Hot Springs following their show the night before. From left to right: Jason Giron, me, John Flanders and Brad Armstrong. Mystic Mike and his Mystic crew produced some beautiful video of the evening, which will be online soon. 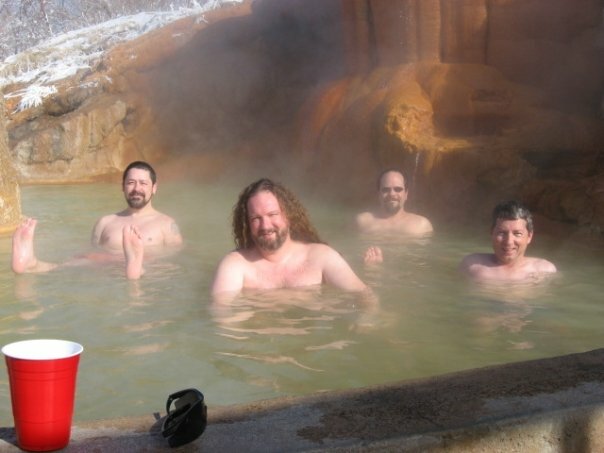 Mystic Hot Springs - Monroe, Utah USA- January 28, 2009. Photo by Greg Friedman? 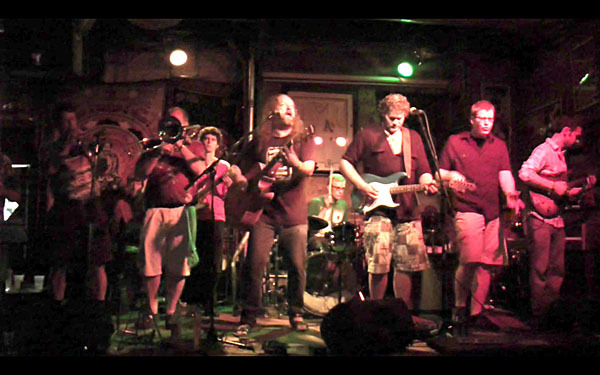 Chicago Mike's InterGalactic Brother & Sisterhood of Big Eyed Beans From FUFMO onstage at Mystic Hot Springs. 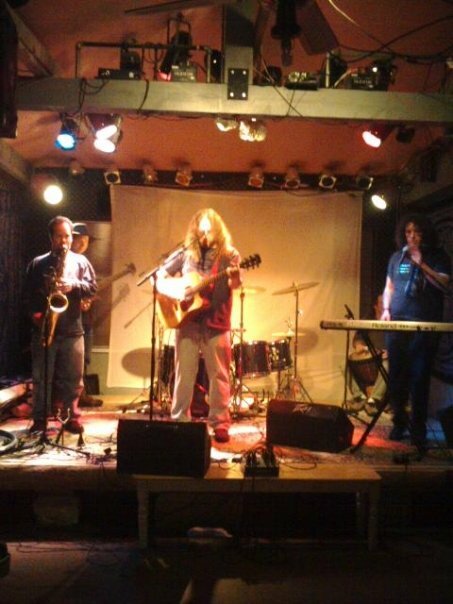 From left to right: John Flanders - saxophone, Brad Armstrong - electric 6 string bass, me, obscured by me = Jason Giron - drums, Greg Friedman (seated) - djembe drum, Baron von Rockenstein - keyboards. Mystic Hot Springs - Monroe, Utah USA- January 27, 2009. Photo by Christopher Hellon? Watch "Chicago Mike: The Movie"
Film-makers and creators of "Chicago Mike: The Movie" at the film's premiere at Slamdance Film Festival, January 23, 2009. From left to right: Director of Motion Graphics Comfort Arthur, Director of Photography Josh Stunkel, me (Chicago Mike), Editor Adrianna Abruscato and Director George Kalantzis. Photo by Greg Friedman. The good folks in the above photo made a short film about me and the music we present during Film Festival Week at Access Film-Music Showcase. Link to Real Ideas Studios to learn more. Turns out our film did not win the competition, but it was a lot of fun to make and the filmmakers should be proud of their work. Eight teams were given one week to conceive, shoot, edit, post and present a short film. Through a random chance encounter at the Slamdance Opening Night party, Team #8, comprised of Director George Kalantzis, Editor Adrianna Abruscato, Director of Photography Josh Stunkel and Director of Motion Graphics Comfort Arthur, chose me as their subject. To watch the Chicago Mike: The Movie, click here. We made it! Our long drive from Libertyville, Illinois to Park City, Utah is over! Despite highway closures caused by high winds in Laramie, Wyoming, Burf and I made it to Utah! The Minivan can!!! 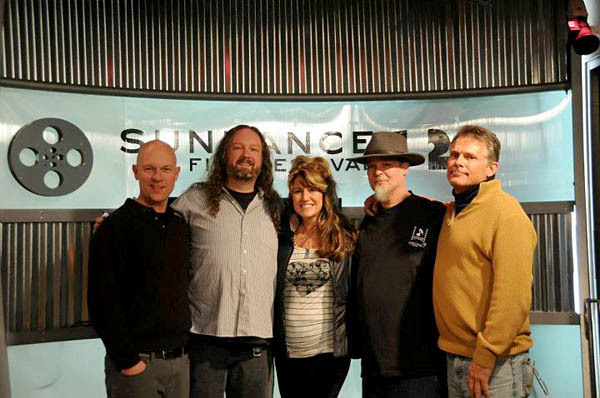 As in years past, I will be performing at the Sundance Film Festival -- This year, I'll play an acoustic show with James Moors on Monday, January 19, 2009 from 3:00pm 'til 5:00pm at Sundance headquarters, inside Timbers Lounge at the Park City Marriott. I'll also once again be performing at Access Film-Music Showcase and hosting most of the performances throughout the 12 day music festival. We've got an amazing lineup this year, featuring world-class music from all over the USA. And a day I look forward to more than just about any other, our annual "Wrap Party / Hootenanny" at The Spur Bar & Grill, this year taking place on Sunday, January 25, 2009 from 3:00pm 'til 7:00pm. On Wednesday, January 14, the night after we arrived in Utah, I played a set at the Access Film-Music "Sneak-Peek" Launch Party at Green Street in Salt Lake City. Some amazing music was performed, featuring several of the artists performing at Access Film-Music Showcase during Film Festival Week including Parkin' Lot, James Moors, Victoria Vox and Fictionist. Looking forward to an amazing week of music here in Park City! I'll also be playing some solo and band shows throughout Utah and Colorado in January, including the "Another Ricochet House Concert" with James Moors, Kort McCumber and Marv Hamilton on Sunday, January 18th, and a Big Eyed Beans From FUFMO performance at Mystic Hot Springs in Monroe, Utah on Tuesday, January 27th. On the way home to Illinois, I've got some solo gigs at the Avery Brewing Company in Boulder, Colorado, The Cala Inn in nearby Dillon, Colorado and an appearance with James Moors at The Old Town Pub in Steamboat Springs, Colorado. Check the Tour Calendar for the most complete and up-to-date list of performances, along with maps and directions to every gig. Chicago Mike jams with WLUP's Jonathon Brandmeier Saturday night! Chicago Mike on Chicago's Classic Rock Radio WLUP 97.9 FM "The Loop", and Jams with Johnny B! 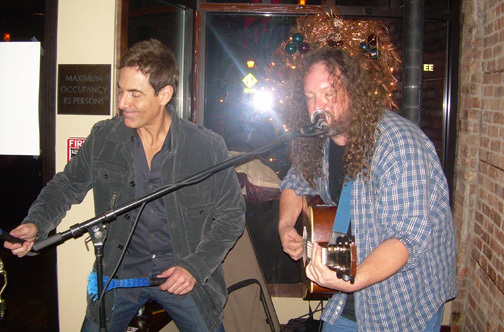 Saturday night I played a last-minute solo acoustic gig at 545 North Bar & Grill, an upscale, intimate eatery in my hometown of Libertyville. Most people who've been to my "solo acoustic" shows know that they are rarely "solo". My good friend, percussionist and performer Jerry Hall brought his bongos and a cornucopia of percussion instruments to share with the audience. 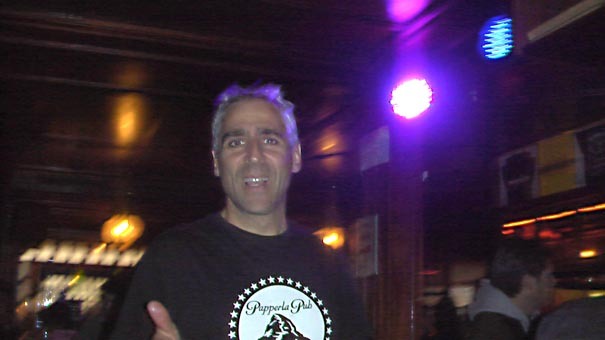 Chicago radio legend Jonathon Brandmeier, morning-man on Chicago's Classic Rock station WLUP 97.9 FM "The Loop", happened to be in 545 North's dining room enjoying dinner and dropped into the bar afterwards. After a few turns on the dance floor, Johnny B joined me on the bongos for Adam Sandler's "Hannukah Song", then spent the rest of the night dancing, singing and playing bongos with me on song after song, including Bad Company's "Shooting Star" and AC/DCs "Highway to Hell". Johnny was incredibly gracious and complimentary, and said he really had a lot of respect for us working musicians. I've been a loyal Loop listener since they went on the air back in 1977 when I was 13 years old! It's the only station in Chicago where you can regularly hear some of my all-time favorite rockers like Triumph, Ted Nugent, Robin Trower, UFO, Styx, Van Halen and a whole mess o' Led Zeppelin. The show, which started at 10pm, ran right until closing time a few minutes before 3am, with only one short break. Lots of folks dancing and singing and banging on stuff. Great fun! Thanks Johnny B for making a fun night even funner! Come back anytime! So Monday morning, I wake up to hearing my name mentioned on Johnny's radio show. I call in to the studio and get put on the air with Johnny B! Blowing my mind!!! Next thing I know, he asks "Which song should I play from your CD?" I suggest "(If) The Soup is Good", track #1 from my CD which I wrote with Rik Meijer and Boy Brostowski, members of my Dutch band Big Eyed Beans From Fryslân. He was only able to play a couple minutes of the 5+ minute song, but more people heard that broadcast than have probably ever heard the song in all the previous radio broadcasts and live performances combined -- Johnny B's audience is huge! What a thrill! Thanks so much Johnny B and WLUP 97.9 FM for bringing Christmas early this year! You're always welcome on my stage! In the next couple days, you will be able to listen to an edited recording of the broadcast right here. PS Special shout out to the extraordinarily gifted Bean's bassplayer Bill Bowden for teaching me and Frodo how to play my own song! SPRING 2009 EUROPEAN TOUR DATES ANNOUNCED! 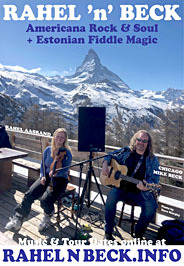 Starting with perfomances in Saas-Grund and Zermattt, Switzerland in early March, Chicago Mike's Spring 2009 European Tour will include shows in Germany, France, Luxembourg, The Nethelands and Denmark. Unfortunately, it doesn't look like expected shows in Italy are going to happen this Spring, but our Italian fans should look for us to return to Torino and Verona in Spring 2010. And our 2009 gigs in Switzerland are only 5 hours away -- Corsa della strada! (I hope that's Italian for "Road Trip"). On tour with me this year will be Chicago Green Beans Max Benson on bass and Neal Daniels on drums, along with legendary guitarist Robbie Stokes, whose band Devil's Kitchen used to open for the Grateful Dead in the late '60s and early '70s, and who played guitar on solo albums by Grateful Dead members Mickey Hart and Robert Hunter. The extraordinary Mitch Lewis from Toronto, Canada will also be back on guitar for some shows, as will the equally extraordinary Christof Bauwens from Groningen, The Netherlands' monster power trio Van der Linde. Still no word on whether Baron von Rockenstein and his cape and keyboard will return to Zermatt for the Spring tour, but we're all anxiously hoping so. Confirmed 2009 Spring European tour dates are already on my Tour Calendar, but check back frequently for updates over the coming weeks, or sign up for my mailing list, below. The only required field, marked * is your email address, but filling out the other fields helps me send you only concert updates that are relevant to you. If you would like to receive concert updates by text message on your mobile phone, through MySpace, by postal delivery, or would like to provide additional info, please click here. Don't worry! I promise I won't sell your email address to Nigerian bank managers that seek your help in getting access to millions of dollars trapped in off-shore bank accounts. My sincere apologies!!! Those of you who know me well won't find it surprising that sometimes it takes me a LONG time to get things done. But when I looked at my website and saw that the top headline was an announcement of my Autumn 2007 European Tour Dates, and that I was already over a month deep into my Spring 2008 European Tour, I knew immediate action was required. Thanks to GigPal.net, my tour calendar is always up-to-date, but alas, my all-too human nature is required to update this text on my home page. Did I tell you about the robots? Anyway, I'm on tour in Europe right now. I performed with the Big Eyed Beans From Fryslân in the north of The Netherlands, gigged 8 glorious nights in Zermatt, Switzerland with Chicago Mike's InterGalactic Brother & Sisterhood of Big Eyed Beans, 2 nights on top of the world in Saas-Fee / Saas-Grund, Switzerland, 2 great gigs in Torino and Verona, Italy with Venetian Bean Claudio Adamo, and I'm writing this in Mainz, Germany. We're heading to Saarbrücken, Germany for shows this weekend, then to France next week, then back to Switzerland for a month of shows before wrapping up the tour (probably) in The Netherlands. April in Amsterdam! Woo hoo! I hope to add photos from this tour to my website tomorrow, but forgive me if it takes a couple years. I'll update the site as soon as possible, really, I will. I want to extend a huge dose of gratitude to Bose Europe for once again sponsoring my European tours, as well as Cort Guitars, Libertyville Music, and GigPal.net. And keep your eyes peeled for our latest ventures BigUgly.TV and RocknRollAdventure.com. Josh Martinez has been on tour with me since the Sundance Film Festival in January 2008 and has been shooting a video documentary of the entire tour. Can't wait to see it! 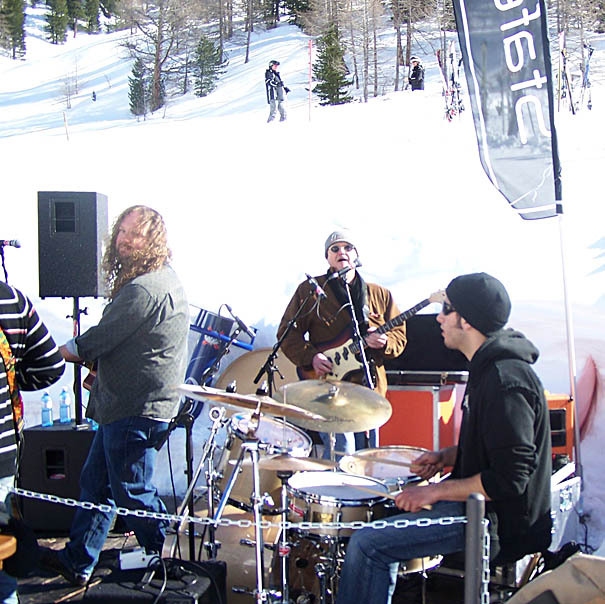 Once again, the Sundance Film Festival kicked off with my performance at the Sundance headquarters on opening day. I also performed at the Hard Rock Cafe, Radical Rat Film-Music Showcase, and did 2 rockin' gigs in Salt Lake City with Big Eyed Beans From FUFMO, one at hard-rock / metal mecca Club Vegas, and our annual Beans reunion show, this year held at Cruzrs. Got to see lots of friends, jam with my band, whoop it up at two hootenannies, play a bunch of gigs, but I didn't see a single film. Gotta fix that for next year! 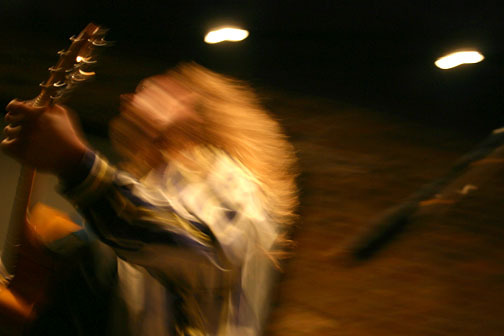 Kicking off with an October 25 appearance at the Muziek-Totaal Festival at Backstage in Deventer, The Netherlands, my Autumn 2007 European Tour will hit seven additional venues in The Netherlands, including my first-ever performance in the city of Amsterdam, taking place at KHL on October 28. On Tuesday, October 30, I'll be performing live on-the-air on WOS Radio's Live Alive broadcast near The Hague with Big Eyed Beans From Fryslân's Rik Meyer, Boy Brostowski and Eibe Gerhartl. 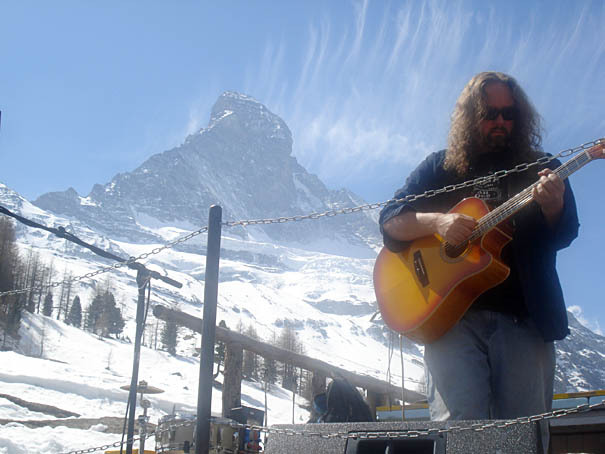 A few shows in the fabulous Swiss mountain village of Zermatt will finish off my 2007 European performances, but I'll return to Europe in late January 2008 for tour dates in Switzerland, France, Germany, The Netherlands and Italy, including a band performance at the Festival di Gilgamesh in Torino, Italy. Check the tour calendar for updates and new concert dates as they get confirmed. Seven weeks, seven world-class guitarists --- Chicago Mike and his InterGalactic Brother & Sisterhood of Big Eyed Beans descend upon the mountain town of Zermatt, Switzerland to inaugurate Mike's first Guitar Summit. Each night Mike and the Beans will perform, accompanied by a featured guest guitarist from North America or Europe. Chicago Mike's Guitar Summit is a production of Big Ugly Music & Media, and is presented with generous support from Bose Europe, Radical Rat, DDA Agency, Papperla Pub and GigPal.net. 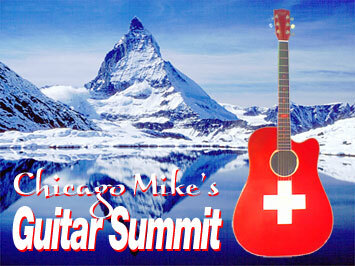 To see the full roster of guitarists and a performance schedule, visit GuitarSummit.net. No doubt, this will be a peak musical experience! Working once again with engineer Andy Sabin at his Chicago studio (Andy co-produced my first CD in 2001 along with Alex Hall), we have begun recording tracks for a new EP to be released next month. These sessions have featured the angelic Nora O'Connor and members of Big Eyed Beans From Venus' Chicago chapter, including Grateful Gary on bass fiddle, Jay Sinclair on drums with Mando Dave Bagdade on mandolin, guitar, harmony vocals and sharing the production responsibilities. We're recording an old original of mine -- one of the first songs I ever wrote -- and a couple great covers that have been staples of my live show for years. I'm excited to finally get these songs on CD -- They're some of my favorites! More info soon. Kicking off the 2007 Sundance Film Festival on Friday, January 19, Mike will perform an acoustic set opening weekend at Sundance Headquarters with longtime FUFMO Bean Carl Roehmann. I'm returning for my fourth year as a performer and producer of the Radical Rat Film-Music Showcase, taking place during "Film Festival Week" in Park City, Utah from January 18 through January 28. 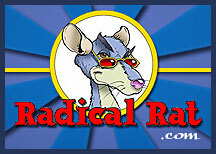 Once again, Radical Rat opens with a "Sneak-Peek" Launch Party at the Hard Rock Café in Salt Lake City, Utah on January 17, 2007. The night is filled with incredible performers, including Mary Beth Maziarz, Cosy Sheridan, Rich Wyman, Casey Desmond, Andy Monaco, Kort McCumber, Gigi Love, Tim Wray of Fat Paw and Sterling Waters. After an amazing week on the South Rim at the Grand Canyon's historic Bright Angel Lodge last August, I've been invited back for ten additional performances in 2007. The first stretch of Grand Canyon shows starts June 12 and runs through June 16. Then I'll be back for another week on the South Rim from September 18 - 22, 2007. 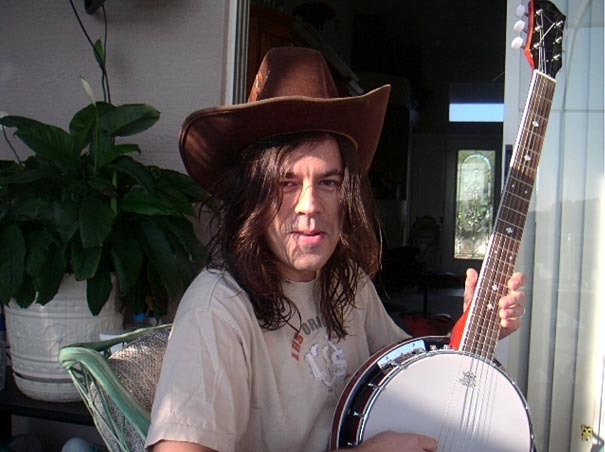 Kicking off a string of 35 shows with Big Eyed Beans International in Switzerland, Germany and France, my Spring 2007 European tour starts February 26 in Zermatt, Switzerland. The tour will also take me back to Holland and Belgium, and my first performances in Italy. Check my tour calendar for the full schedule of European tour dates. If you've checked this website lately, you've probably noticed not much has changed besides my tour calendar. That's because we've been investing our time into the brand-spankin'-new ChicagoMike.com web site, featuring all sorts of vital improvements! Thanks for your patience... The new website should be online shortly! Enjoy the old site while you still can! If you happen to be driving through Cluj, Romania at 9:30pm on Thursday, January 19, tune into Radio Mix FM 92.2 FM. DJ Stefan Coroian will be interviewing me live on the air --- We'll be talking about the recording sessions for our latest single "(If) The Soup Is Good", and our upcoming DVD release "Live In Libertyville". I know it sounds like I just made this up for Halloween --- I swear I did not. 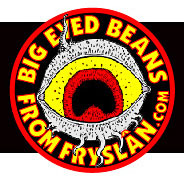 Earlier today (Friday, October 28), DJ Stefan Coroian from Radio Mix FM in Cluj, Transylvania, Romania contacted me about the new single from Big Eyed Beans From Fryslân, "(If) The Soup Is Good". Stefan asked to arrange an interview for the Transylvanian radio station and referred to the single as "Great music". Once the interview has been scheduled, I'll post it to my tour calendar. If you're going to be in Transylvania, please tune in! Thanks Stefan! I'll be on tour with Mando Dave Bagdade and Martha Murphy on the fiddle in Nova Scotia, Canada from August 23 through August 28. Check the tour calendar for the complete tour schedule; Highlights include performances on Cape Breton in Sydney and St. Peters. I've been told that the area is simply breathtaking and I can't wait to experience it for myself! Planet Bluegrass is the organization that puts on the world-famous Telluride Bluegrass Festival each year. However, this incredible group also host several other festivals and events, including the Rocky Mountain FolksFest and their annual SongSchool. The SongSchool brings songwriters from all over together for an in-depth, hands-on exploration of the art, craft and business of songwriting. Faculty include Vance Gilbert, Sweet Honey In The Rock's Dr. Ysaye Barnwell, Lisa Loeb, Willie Porter and other exceptional talents. This year, I've been invited to conduct my International Touring Workshop at the SongSchool --- I'm looking forward to sharing my insights, contacts, foibles and experiences from four years of touring in Europe. I've attended SongSchool twice as a student in the past and can state unequivocally that they remain some of the peak experiences in my life. I am excited to participate this year, not only as a student, but as a member of the faculty! The Rocky Mountain FolksFest, which immediately follows the SongSchool and runs August 19 - 21 boasts an amazing lineup this year --- Arlo Guthrie, Steve Earle, Loudon Wainwright III, Joan Armatrading, Taj Mahal and many many others. One of the coolest aspects of the festival is the incredible campfire scene that takes place after the day's scheduled performers have finished. Camping takes place right on the festival grounds at Planet Bluegrass Ranch in Lyons, Colorado -- Located in an idyllic red-rock canyon through which the St. Vrain River runs. Both the SongSchool and FolksFest are amazing experiences which I can't recommend strongly enough! "(If) The Soup Is Good" by Big Eyed Beans From Fryslân has been released as an advance promo single to radio stations throughout Holland and Germany. Inspired by one of Bean drummer Boy Brostowski's ubiquitous pearls of wisdom, the song was the first writing collaboration between me, Friesen Bean guitarist Rik Meyer, and Boy. We recorded it last Spring at the studio of Nico Outhuyse in Leeuwarden, who co-produced the track with us. Nico is most widely known for his work with famed Dutch pop heroes De Kast, but is now about to release a second CD with his new band Spanner. The track's been getting great feedback. I really dig Rik's lap steel work on this tune, and Boy's drumming is always fun and unpredictable. 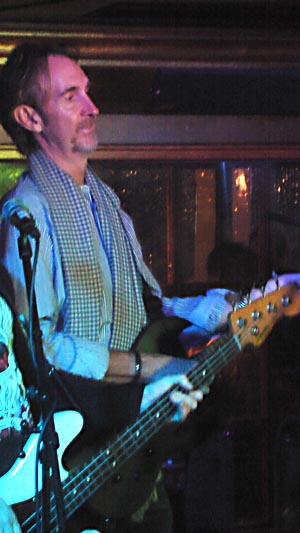 Bass and organ were contributed by Friesen Bean Jan van Ollfen, who is about to embark upon a long term tour with progressive rock legends Kayak. "(If) The Soup Is Good" is a bonus audio track that will be offered on our upcoming BIG EYED BEANS FROM VENUS: LIVE IN LIBERTYVILLE DVD release, which we shot in January 2005 and we hope to release later this Spring. For now you can check out this MP3 preview online and see which radio stations are airing the song. I performed live on CRACKS Radio on Tuesday, April 5. CRACKS, hosted by Jaap Hoek, has been one of my most ardent supporters in Nederland, having aired all the tracks from my first CD. Jaap has earned the distinction of being the first DJ in Holland to receive a copy of our new promotional single "(If) The Soup Is Good". Jaap is also the first DJ in Holland to broadcast our new single. Thanks Jaap! Midwest Bean Steve Wik is still AWOL from Libertyville and on tour with me in Holland. 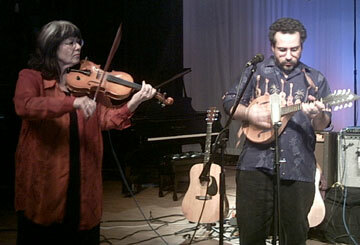 He appeared on CRACKS with me, and also accompanied the immensely talented Kristin Shey who also performed live on CRACKS. Tony Spinner also made an appearance on the show. 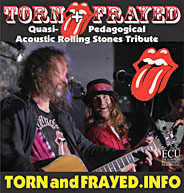 Tony graciously allowed me and Steve to open Tony's Tuesday evening performance at Leiden's Q-Bus later that night. His band ripped it up, thanks to great front work by Tony and guitar giant Sonny Hunt. Mike's Spring 2005 European tour has already hit Switzerland, Germany, France and Holland. After a couple days rest, Mike head's out for a three day swing through Holland. The tour is scheduled to last through early June. Check the calendar for the full, up-to-date tour schedule. Our return to Zermatt was a lot of fun --- Unfortunately Beans Rik Meyer and John Flanders were unable to make the return trip, but Midwest USA Bean Steve Wik and Friesen Bean Boy Brostowski and I were joined for the return trip by the immensely talented guitarist Jay Schreiber from Frankfurt and Bielefeld Germany's rock goddess Kristin Shey. After a brutal all night and day journey leaving directly from a great show Sunday night in Drachten, in the north of Holland, to Zermatt Switzerland to make our Monday night appearance at the Schneeuwittchen night club, we managed to have four amazing nights (amazing for all sorts of different reasons!). Details and photos will be in the Tour Diary someday! After Switzerland, a performance at Saarbrücken's O'Dwyer's Irish Pub was followed by an unforgettable evening with friends old and new at the Bar'B'art in Saint Avold, France. Though Mike has performed here several times, this was the first time he was accompanied by the Beans; And the folks at Bar'B'art gave us an incredible welcome. Thank you Annie, Manu, Pat, Mimi, Morgan, Steve, Ivan and everyone at Bar'B'art. Evenings like that are why we travel so far and hard --- We can't wait to come back! Salt Lake City singer/songwriter Gigi Love has joined the tour for several shows. Check out MP3s and more info on Gigi's web site. Big Eyed Beans From Venus Live Concert DVD Shoot --- This Sunday! 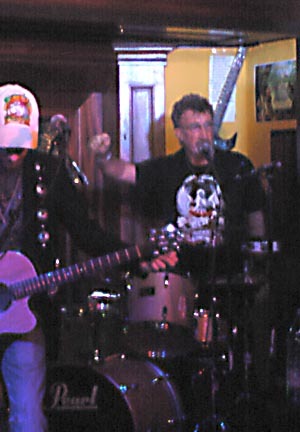 Mike Beck & Big Eyed Beans From Venus will be shooting a Live Concert DVD this Sunday, January 16 at 3:00pm. The concert is open to the public; All ages are welcome. The production will take place in the Studio Theater of Libertyvillle High School, which is located at 708 W. Park Ave. (Route 176) in Libertyville, about 3 blocks west of Milwaukee Ave. (Route 21) . Entry is only $2, or $1 for students and kids, and the proceeds go to benefit the LHS Video Club "CAT TV". The Beans will perform two sets --- First, at 3:00pm, the band will perform an "Electric" set, including Jay Sinclair on drums, Steve Wik on bass fiddle, Frodo Starck on lead guitar, Mando Dave Bagdade on mandolin, guitar and vocals, and Mike Beck on guitar and vocals, along with a few special surprise guests. The second "Acoustic" set starts at 4:30pm and will feature Wik on bass fiddle, Mando Dave on mandolin, Martha Murphy on fiddle and Mike on acoustic guitar and vocals. Please join us --- It's going to be a fantastic experience! Special thanks to video producer Don Johnson and director Artem Okulik for making this production possible! Footage from this 4-camera shoot will be edited into a Live Concert DVD to be released later this year. Mike Beck CD audio producer/engineer Andy Sabin will serve as the production's chief audio engineer, capturing the performance in 16 track digital audio for eventual remixing to 5.1 Surround Sound! Cool! From January 19 through February 10, Mike will be on tour throughout the Western USA, with featured performances at Sundance Film Festival Headquarters in Park City, Utah on Saturday, January 22 of opening weekend, and two appearances at The Radical Rat Café, presented at The Spur in the heart of Park City's historic Main Street on Monday, January 24 and Friday, January 28. To see the complete itinerary of Mike's Western USA tour, check out his Tour Calendar. 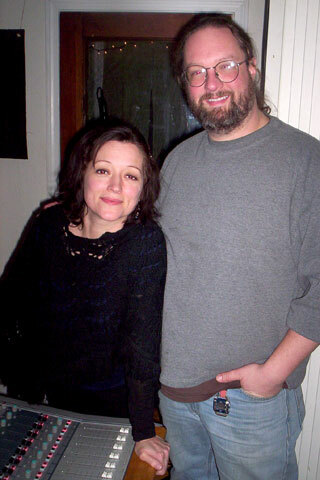 A recent demo session with singer / songwriter Marlo Soule has led to an agreement with Mike to produce Marlo's debut recordings for release on the Savage Music label in 2005. Mike: "Congratulations Marlo! I'm really looking forward to working with you! Your songs are fantastic and I am excited to begin work on the arrangements and recording sessions." Keep your eyes and ears open --- This web site will offer updates on the EP's progress. 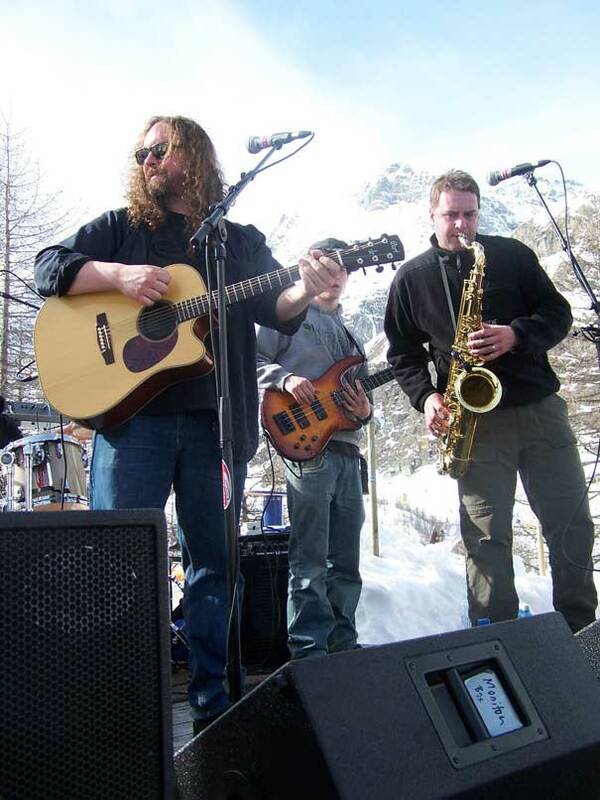 Mike's Spring 2005 European tour will commence on Tuesday, March 1 with a weeklong engagement in Zermatt, Switzerland with Big Eyed Beans From Fryslân. The tour will then proceed through France and southern Germany, eventually landing in The Netherlands in early April. Holland will serve as the base of operations for the balance of Mike's tour, which is scheduled to last through mid-June. Return engagements on the Mediterranean island of Ibiza are planned for early June, though final details are pending. 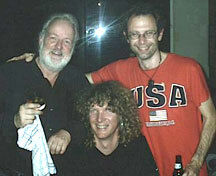 Updates to the Spring 2005 itinerary will be posted on Mike's online tour calendar as they are confirmed. One of my favorite singers on Planet Earth, the talented and lovely Nora O'Connor recently celebrated the release of "'Til The Dawn", her second solo CD release (and first in nearly 10 years)! The CD has deservedly garnered exceptional (practically gushing) reviews and airplay nationwide, including spins on Chicago's WXRT. Longtime Mike Beck fans know Nora from her contributions to Mike's debut CD, released last year. 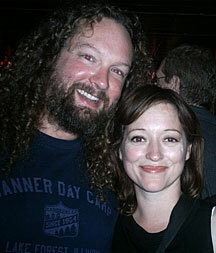 Her lush harmonies grace several songs on Mike's CD including "One Minus One" and "Soulshine". 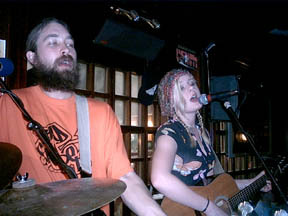 Most folks, though, aren't aware that the first band both Mike and Nora sang for was an acoustic Rolling Stones tribute in the late '80s called Dead Flowers. The trio also boasted guitar and vocals by the inimitable Toney Ventura. Since those halcyon days, Toney has released a couple CDs filled with great songs exhibiting Toney's twisted genius: No Way and Tunes to Last a Lunchtime, as well as tracks on several compilation CDs. Nora released her debut solo CD Cerulean Blue in the mid-'90s, and soon developed a reputation as an A-list side-"man", singing and recording with such musical luminaries as The Blacks, Andrew Bird's Bowl of Fire, the New Pornographers, Wilco's Jeff Tweedy, Neko Case, Billy Corgan and soul legends Otis Clay and Mavis Staples. A heartfelt congratulations to you Nora, and to Bloodshot Records for having the good sense to stick you up front! Wishing you great success with the CD, and much happiness. Sad to say, the Monday night Open Mic @ Hang Outs in Wheeling has ceased to be. Though we were getting some great musicians and singers stopping in to perform on Monday evenings, Hang Outs owner David Igliori decided to move in a different direction, and Hang Outs will now be closed on Monday nights. Most Tuesday nights, you can find Mike at Donelli's Pub in Lake Bluff (on Route 176, two miles East of I-94) where Tom Gerlach runs the friendliest jam around. C'mon in and sing a couple with us! We created a nice musical community at Hang Outs on Monday nights, and I look forward to having the chance to again play with some of the great musicians I met while hosting the Open Mic there. Scott Wolf, Alicia Wallace, Rob, Matt, Kim, Don Anderson --- I hope to see and play with you again soon. I'll let you know when the next Hootenanny is scheduled! You're all certainly welcome guests! The Intergalactic Brother & Sisterhood of Big Eyed Beans welcomes several new members into the fold: The Midwest USA incarnation of Big Eyed Beans From Venus not only gratefully welcomes Premier Bean Little Red Babyface Kaplan back to its loving bosom, but is proud to announce the initiation of brand new Beans Steve Wik on electric bass and doghouse bass, and Jay Sinclair on drums. 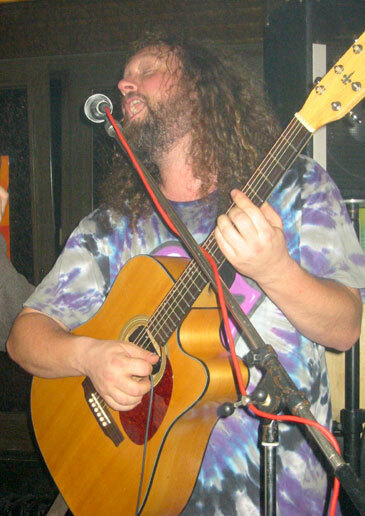 Steve hails from St. Louis and, though young, is nevertheless a veteran road experienced musician. Thanks Matt (luthier/guitar repairman at Libertyville Music) for introducing us! Steve rules! Jay Sinclair, a seasoned drummer and bassplayer, who recently married the lovely and delightful Shari Frederiksen, is now handling drums full-time for the Midwest Beans. Jay is Da Man! Very glad about his being a Bean alongside me! Jay also handles drums for Zipper and Lazy Dog, two great bands from the area. The rumors are true: Little Red Babyface Kaplan, following his years of Homeric journeys across our great nation and the world, including residencies in Madison, Wisconsin, Austin, Texas, Burlington, Vermont, Prague in the Czech Republic, and Portland Oregon, the original Bean has returned to Illiinois, gracing the Beans with his harmonica and keyboard theatrics. Welcome back Derek! We missed you! Now get the hell out of Carol Stream and let's rock! Fledgling aspiring Bean Dan Starck has been initiated into full Bean-hood --- His superlative performance at Donelli's on August 13 ensured his ascension into the Bean brotherhood, and all the benefits such status conveys. He is very proud, and we're excited to add his extraordinary guitar talents to our stage. And finally, Big Eyed Bean mainstays and core members Mando Dave Bagdade and Martha Murphy on the fiddle, have returned from their 3 month tour of Nova Scotia and Atlantic Canada. So glad to have you back --- Really looking forward to our first Midwest Bean Summit --- I hope it's on Friday, September 10 at Donelli's after your Whistle Pig appearance! The Intergalactic Brother & Sisterhood of Big Eyed Beans continues to grow! Thank you all so much for supporting and participating in this grand delusion! Tim Wray and Mike performed live on the CRACKS radio program Friday afternoon May 14, 2004, each performing a half hour set on his own, then coming together for a final song, with Tim contributing dobro accompaniment to Mike's acoustic guitar and vcals. CRACKS has been a big supporter of Mike, having aired every song on his debut CD over a period of several weeks during their weekly broadcasts last Fall. Mike debuted two new original songs on today's performance on CRACKS --- The world radio premiere of the new Beans' track "(If) The Soup Is Good" and a new acoustic composition "You Can End War". A rebroadcast of today's live broadcast will air on Friday, May 21, 2004 at 22:00 on Radio Rijnwoude 106.5 FM, and over the internet at www.radiorijnwoude.nl. Also, an acoustic show with Tim Wray has been added for Wednesday, May 12 in Bielefeld, Germany at the Extraa Blues Bar (Mike's favorite German after-hours club!). Check the complete tour calendar for details and updates! Recording completed for first Big Eyed Beans From Fryslân Composition "(If) The Soup Is Good"
Mike recently completed recording vocals for "(If) The Soup Is Good", the first songwriting collaboration between members of the Frisian Beans. Rik Meyer wrote the music, and Mike wrote the lyrics, inspired by one of Boy's many "Brostowski-isms". Produced by Nico Outhuyse, currently guitarist for Spanner and a former member of Dutch pop heroes De Kast, initial recording took place in late March at Nico's Leeuwarden studio, shortly after Mike's arrival in The Netherlands. An MP3 of "(If) The Soup Is Good" should be available on this web site in the near future. Check back soon! The Expanding Family of Worldwide Beans! Big Eyed Beans From Fryslân drummer Boy Brostowski and bassplayer Jan van Olffen just returned from a two week tour of Indonesia with Indo-Dutch rock legends, the Crazy Rockers (a band who taught the Beatles a thing or two in Hamburg, Germany during the early '60s!). During the Frisian Beans absence, new Beans were brought into the family --- Bassplayer Gerrit Veen, longtime friend and bandmember of tragic Dutch songwriter Herman Brood, and Fokke de Jong, former member of Normaal and currently drummer for De Kast, joined Mike and Rik Meyer for shows in Raalte and Leeuwarden, as well as a performance for the Dutch Army near Stroe. 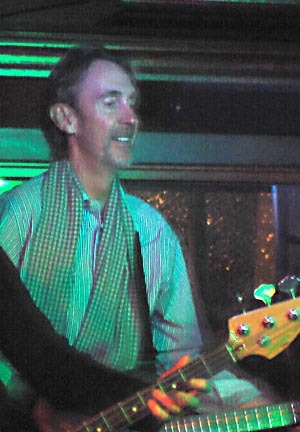 Though not an official Bean, guitarist Graham Stewart qualifies for honorary Bean-hood --- Graham is one of the first musicians Mike played with during his very first solo European appearance in Spring of 2001 at Wiesbaden Irish Pub. 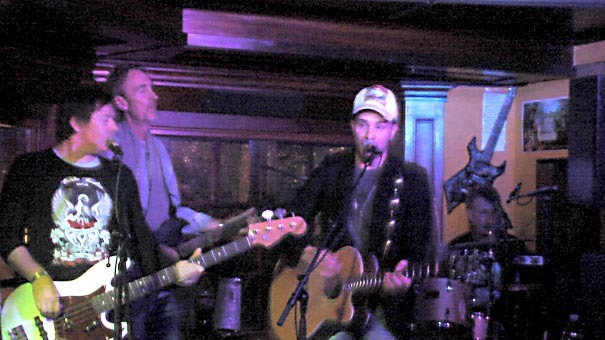 Graham made a surprise guest appearance during Mike's Spring 2004 performance at the Wiesbaden Irish Pub, adding impassioned lead guitar to Mike's Monday late night set. Great to see you and hear you again! Thanks Graham! Photos are online in the tour diary. Mike will be performing on the Spanish island of Ibiza for a week starting May 17th. Check back soon for details and locations. Mike made a guest appearance with the fastest guitarist in the world --- The incredible Joe Stump and his Reign of Terror, along with Half Past Midnight's Rob Orlemans on Sunday, April 25 at the Q-Bus in Leiden, The Netherlands. Photos and video online soon! Making his European performance debut in Zwolle, The Netherlands at the Bourbon Street cafe, Fat Paw's Tim Wray has joined Mike's Spring tour. He has been performing an opening set each night, featuring a few Dobro guitar selections and several original compositions. Tim then joins Mike for part of his solo performances, contributing tasty electric guitar work. 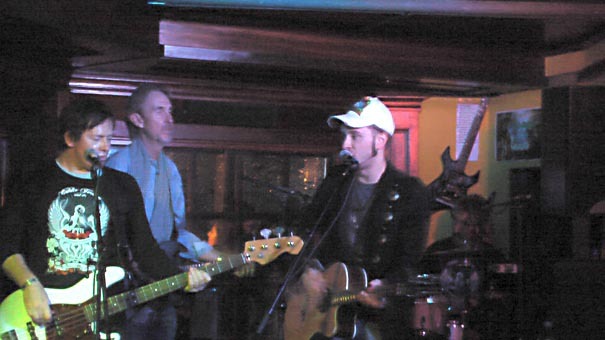 Mike was joined by Big Eyed Beans From Fryslân --- Rik Meyer on guitar, Jan van Olffen on bass, and the inimitable Boy Brostowski on drums --- for the first three shows of his Spring Tour 2004. Photos are now online! Check'em out! Before the official tour launch on Friday, March 26 in Heerenveen, the Beans spent Thursday in a Leeuwarden recording studio working a on a new single, "(If) The Soup Is Good". Produced by Nico Outhuyse (former guitarist for Dutch pop idols De Kast and now with the rock band Spanner) and Beans' guitarist Rik Meyer, who also co-wrote the song with Mike and Boy Brostowski, the instrumental tracks turned out great! Mike returns to the studio in early April to record his vocals. Keep your eyes on this web site for an MP3 preview in the near future. Guitarist Tim Wray joins Mike and the Beans on tour April 21, and will accompany Mike in May for acoustic shows in Germany, France and on the Mediterranean island of Ibiza. Check out their full tour schedule! Well, not exactly huge, perhaps, but recent emails received from McMurdo Station located on what residents affectionately refer to as "the ice" indicate that Mike's CD is enjoying enthusiastic spins on the continent that sits on the bottom of the world. Very cool! Possibilities for performances in Antartica are currently being explored. Keep your eyes on this web site for developments. Music distribution innovator Mediaport celebrates the launch of their "burn on demand CD listening station kiosks". Mike's CD is one of several selections currently offered through Mediaport's distribution network. Spring 2004 European Tour Dates Announced! 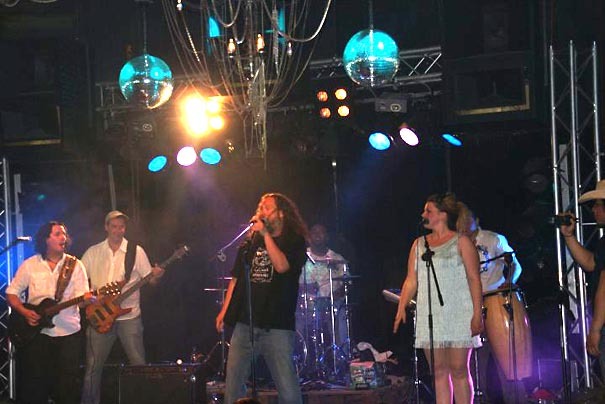 Launching with a performance at Heerenveen's Zevende Hemel on Friday, 26 March, Chicago Mike & Big Eyed Beans From Fryslân's Spring 2004 European Tour will visit two dozen venues in Holland and Germany through mid–May. Check the full tour itinerary! 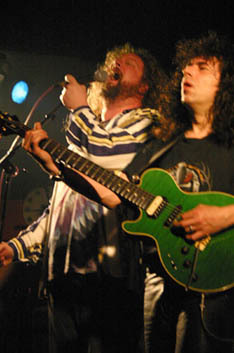 L-R: Boy Brostowski (drums), Rik Meyer (guitar), and Jan van Olffen (bass). Mike Beck endorses Presidential candidate Dennis Kucinich! After exhaustive research, consideration and reflection, Mike has announced his endorsement for Presidential candidate Dennis Kucinich. Mike: "He's got the vision. Check him out." The future of humanity is in your hands. 2004 will prove a decisive year for America and the world. Make your voice heard --- Register to vote today. For your convenience, voter registration forms for each state in the USA are available here. In Spring 2004, from March 23 through May 25, Chicago Mike will be on tour with Big Eyed Beans From Fryslân throughout The Netherlands and Germany. New dates are being added everyday -- Take a look at the upcoming tour schedule. For the 8th straight year, Mike will be performing in Park City and Salt Lake City, Utah during the Sundance Film Festival. Check out Mike's tour calendar to find out where and when. Listen for Mike's radio interview and live performance on Radio Free Utah KRCL 90.9 FM Salt Lake City / 96.5 FM Park City during Paul Dowler's Drive Time Afternoon radio program between 3:00pm and 5:30pm on Thursday, January 15. 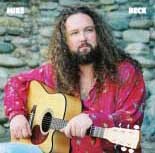 New Mike Beck CD available! Combining new tracks recorded with Big Eyed Beans From Fryslân last May with the best 5 cuts from the Chicago Mike CD, a new Mike Beck CD is now available. New vocals for two tracks from Chicago Mike have been recorded, with new mixes and a new mastering job putting the final polish on the release. Listen to MP3s online and order yours today! Mike sings for Miss America! Mike recently sang the Miss America theme song... "There she is, Miss America" to Miss America 2003, Erika Harold! What a thrill! Photos and video coming soon. YES! It has finally happened! 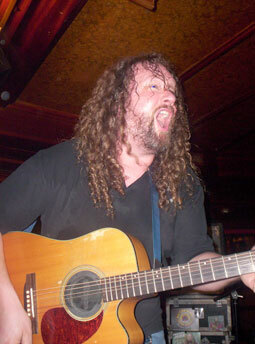 All the photos from Mike's Spring 2003 European Tour have finally been posted! Check them out! From his opening night with Canned Heat and Half Past Midnight to his closing performances with Big Eyed Beans From Fryslân and Marshmellow Steamroller, this was an amazing tour! Thanks everybody for making it a success! 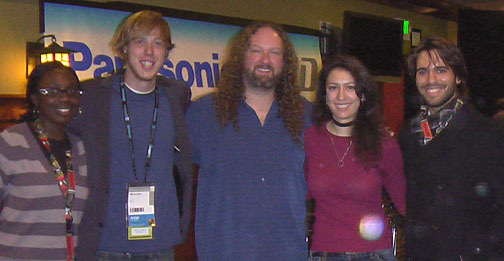 The July 2003 issue of UK-based recording and audio magazine Music Tech features a photo from the recording sessions for the Mike Beck CD. Mike shot this photo of trombonist Brent Sanders during the horn session for Johnny Y., and Music Tech used the photo in an article discussing proper horn recording techniques (good job Andy Sabin!!). During Mike's Spring 2003 tour, Big Eyed Beans From Fryslan spent an afternoon in Rob Orlemans' Rodisc Recording Studio in Tiel. The Friesen Beans recorded 5 songs together: Two of Mike's originals, a lowdown Blues by Rik Meyer (played on his lapsteel! ), and "live" takes of Let It Bleed and Big Bill Broonzy's Key To The Highway. Three new mixes are available online for you to hear! Check'em out and let me know what you think! Mike's Spring 2003 European Tour was extended through the end of May. 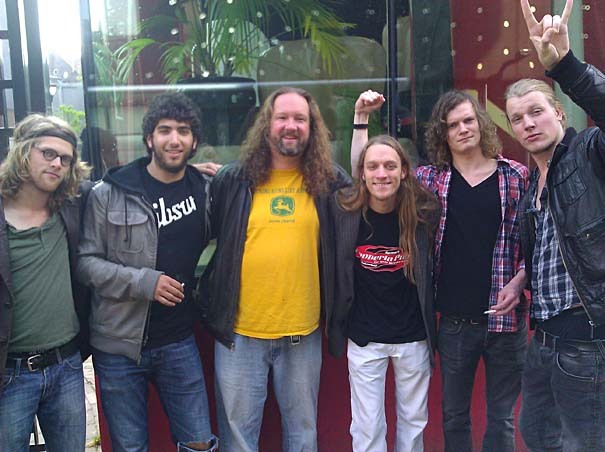 Mike hooked up with some killer musicians from Friesland, in the North of Nederland, and half a dozen shows were added to the tour. Photos are coming soon. 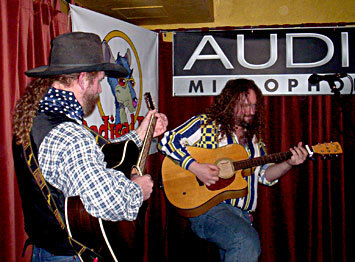 Singer-Songwriter-Supertalent Steve Kouba joined the Chicago Mike Spring 2003 European Tour from April 1 through April 30. His first performance was at Café de Cactus in Hengelo, The Netherlands on Thursday, April 3 and his last was April 30 in Harmelen for the Koninginnendag celebration. Check out photos! It's a Jah Love World, y'all. On Wednesday, April 16 at the Highland Hotel in Soest, Germany, an historic musical event took place... Piano-Mania Smackdown 2003! Featuring performances by Chicago Mike, Steve Kouba, Piano phenom / hit songwriter Rich Wyman, wildman-on-the-keyboards and Big Eyed Bean From Utah Jeremy Hughes, and new friend, singer-songwriter-wunderkind Kristin Shey. A wonderful evening, followed by a fanstastic into-the-wee-hours morning of music, with Rich, Kristin, and Nigel Prickett, brother of Highland owner Jason Prickett and Soest glamour girl Kelsey Klamath. Sadly, this was one of the final performances at the Highland Hotel, as it was sold at the end of April. Photos are online now! Songs from Mike's CD have been getting some very nice reviews on GarageBand.com. Mike's song The Ghost of Mrs. Adler scored in the top 20% of all songs in the Folk/Country Category and so has moved into the 2nd round of their contest. Check it out at GarageBand.com/MikeBeck. Order your Chicago Mike CD online now! The first pressing is nearly sold out, and the next pressing will have several different songs and remixes. Get your first edition Chicago Mike CD now, before they're gone forever! 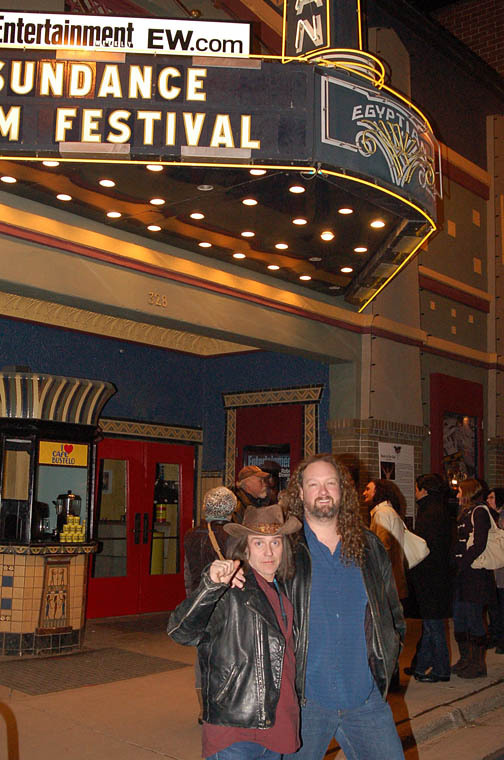 Mike and guitarist Wendell Kelsey invaded the 2003 Sundance Film Festival in Park City, Utah in January. Photos coming soon! 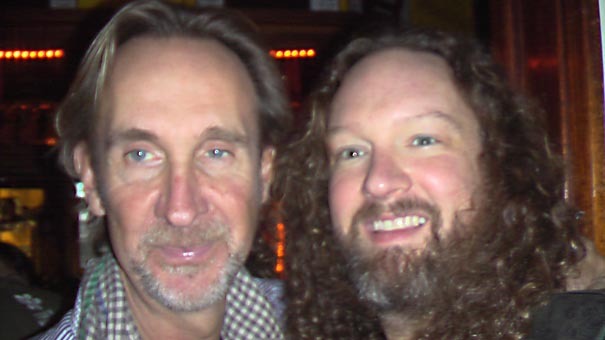 Read about Mike's chance encounter with Spinal Tap bassplayer / creative force Derek Smalls! Are you a member of the media, looking for high-resolution images and press information? Please click here to visit the Mike Beck / Big Eyed Beans From Venus Media Archive. Looking for Mike Beck, the Brooklyn, New York-based musician and songwriter? Visit www.beckmusic.com. Looking for Mike Beck, the Cowboy Poet / Western Singer / Songwriter / Champion Equestrian ? Try here... www.mikebeck.com. Looking for Chicago Mike the custom restaurant booth artisan? Try here... www.precisionbooth.com. There are many talented Mike Beck's out there! I want to put together a concert where all the band members are Mike Beck. If you can help, please email! They say you can never have enough Mike Beck! Any musicians out there named Mike Beck --- I invite you to accept an opening slot for any of my concerts! You are also welcome to sit-in, if you wish, at any show. Feel free to contact me ahead of time, so we can discuss song selection and publicizie the event, but this is not required. Looking forward to meeting you!